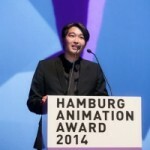 On June 24th, the Animation Award was awarded in Hamburg for the 11th time. For the first time, a games category was added for the prize for young talent in the international animation industry. It was an honor for us to provide the €4000 worth of prize money. Encouraging young talent is essential for the gaming industry, as we are always in need of qualified and talented personnel in the art department. A speech was given at the ceremony by GameOne legend and Games TV pioneer Daniel Budiman. He gave an impassioned but also very amusing talk on the importance of the flourishing gaming industry, especially in Hamburg, and how it has been ignored and stigmatized for years. Only slowly, said Budiman, are people realizing how important games are as a basic need, and how many jobs and unusual career opportunities are offered by the industry. People are also coming round to the fact that video games do not mean scams, dependency and killing sprees, he added. The prize in the games category was won by a student team from the Hamburg University of Applied Sciences. The winning game “Shards of eternity” had already won the German Computer Game Prize. We would like to congratulate Mathias Fischer, Michael Kluge, Clemens Kügler, Marc Victorin and Vanessa Zeeb for developing this fantastic game. We would also like to thank the Hamburg Chamber of Commerce and the Animation School Hamburg for organizing the award and for creating the games category.